At leassttt upgrade na ho tayo!!! Within the month na ang backlog charrrr! 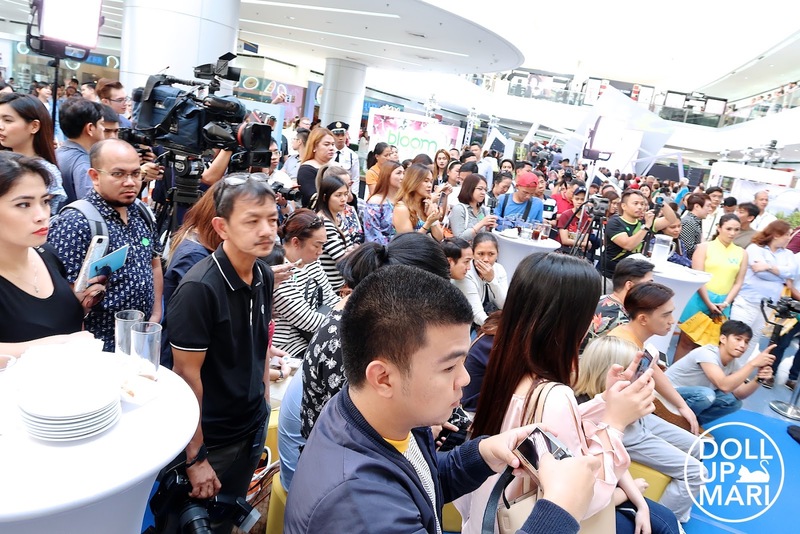 This is Watsons Love The Sun event held at SM MOA last March 8, or Women's Day. I find the date of the event to be very apt, because when it comes to self care, we have this whole list of processed. From whitening treatments, spa sessions, facials, and all that, every woman has her own concept of self care. But realistically, sun care is such an integral part of self care. AFAIK, our ozone layer has only started to stabilize a bit as of late, but still, it doesn't dismiss the existing damage it has suffered. There's still a big ozone layer hole, and we really need to be on the defensive and to take sun care very seriously. Honestly, one misconception that we usually have is that we only need sunscreen during the summer or during outings. But I've learned that every body part that gets exposed to the sun even for a short period of time needs sunscreen every single day. This year, even though I technically have shunned the concept of new year's resolutions, I vowed to pay more attention to sun care. I placed all the sunscreens I have in my dresser, such that when I get ready each day, it'll be automatic to me to pick up the sunscreen and to apply liberally on my face and all body parts that will not be covered by clothes. 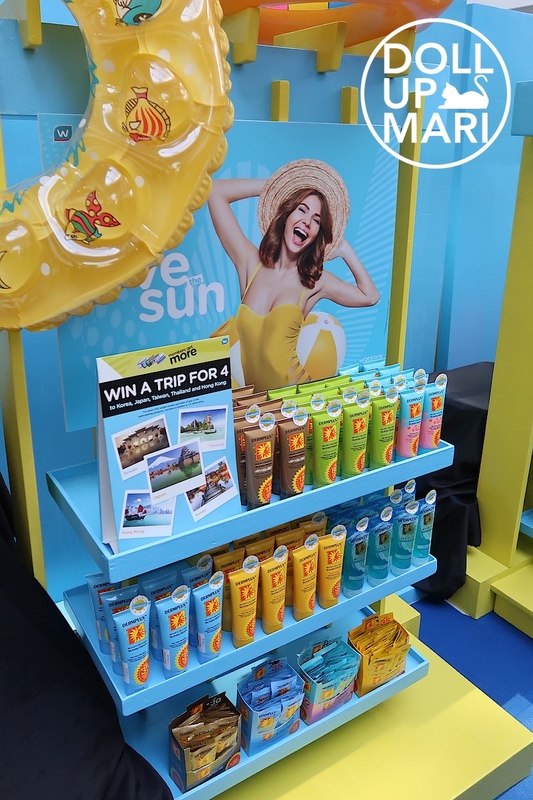 As for this event, Watsons pooled in all their brands that specialize in sun care. They sent this photo in, because when I got to the event, these ladies were already hustling with assisting people! And it was already so crowded. As seen here, there is a booth for SunPlay, Bioré and Céleteque. I haven't tried SunPlay yet, so there's not much I can say. As for Bioré, I really love their sunscreen range as they don't get washed off easily. The BB Sunscreens also reaaaally have a great amount of coverage that it can really pass off as BB cream already. As for Céleteque, everything is awesome if you ask me. They have gone from strength to strength in all their releases, and I love how they use all the data available through them in their thorough scientific studies to come up with solutions for Filipina beauty issues. For this event, they had a lot of members of the press and media come over. Cristalle Belo is visibly glowing even from afar because of course, she's a Belo girl. But well, she has not denied being pregnant when asked as of late, so maybe there's a second source of her glow! I'm wishing for all the best for her. Cristalle talked about how Belo Sun came to be. For the longest time, her mom used to chastise people to use sunscreen. As a beauty and skin expert, those were of course things we expected fr. the Dra. Vicki Belo. However, Cristalle revealed that her own mother failed to use sunscreen regularly despite preaching others to do so. When they tried to go deeper to the cause and try to understand why she couldn't religiously use it, they realized that there just wasn't any brand at the time that provided sun protection without being too hot and heavy for this weather. 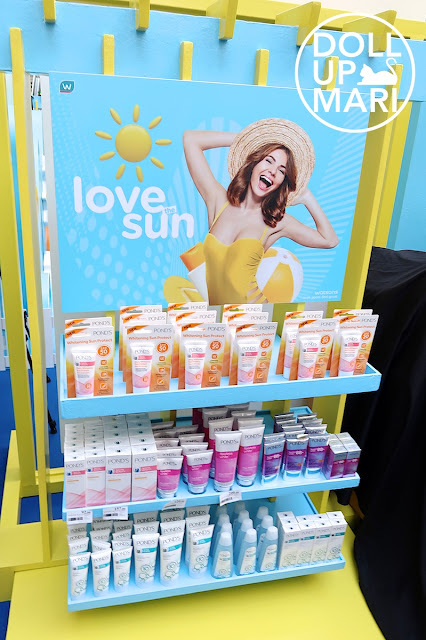 Looking back, before Belo Sun, almost all sunscreen brands had formulations that were so gunky that we Pinoys couldn't realistically use them for everyday. Looking back, sunscreen was this item that we only associated with swimming and excursions, despite the sun shining over us every single day. 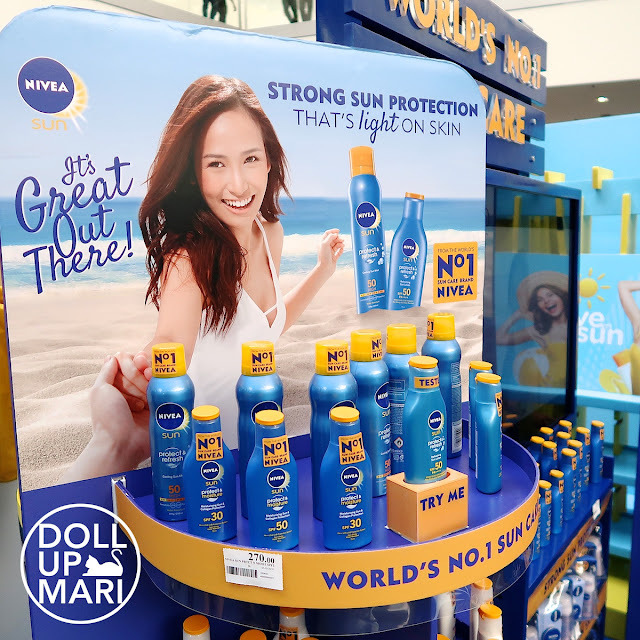 It took the leaps of faith of brands such as Belo Sun in order to normalize sunscreen usage for everyday for Pinoys. Their whole range is lightweight, not hot on the skin (like having a greenhouse effect), and is absorbed fairly quickly to be used everyday. Model and mom extraordinaire Nicole Hernandez was also present at the event and shared how she has been part of the process. She would tell Cristalle and the team without restraint whenever she didn't like something about the initial prototypes. She was very vocal about how she felt, that all the finished products are products that she likes. 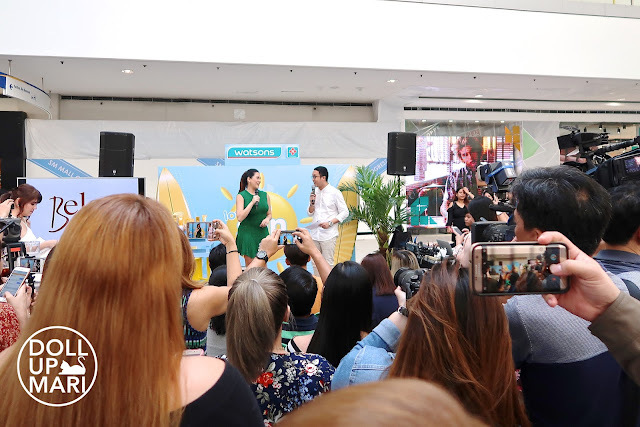 She shared that her most practical find is Belo's Sun spray because she can spray it on her kids while they are running away from her. We all know how annoyed kids can get when it comes so sunscreen application, so it helps to have something like Belo's mist. To add, versus competitors, Belo's mist sprays at any angle, so it's really easy to spray it even from an awkward angle. Cristalle and Nicole also mused how much they love Belo Sun's tinted sunscreen, which they use everyday. 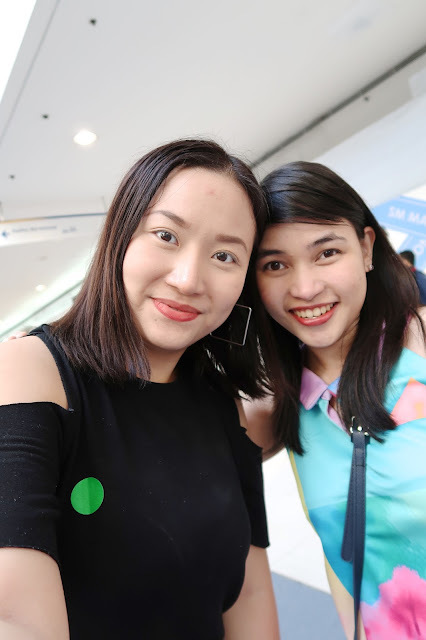 For people like them, since I don't see so much discolorations on them, it's believable that they are able to survive on just Belo tinted sunscreen. Personally, I have really dark under eye circles, so while the tinted sunscreen provides a brightening effect on me, I still have to use concealer and a pigmented powder to really color correct my discolorations. It was a full house today! As for Nivea, I have no photos of the stage portion, because I was the stage portion! They asked unsuspecting volunteers to dance to their newest jingle wahahaha. I am thankful no photos seem to have been published thus far, because I prolly must have looked like a total fool in my stage segment wahahahaha. But okay! As for Nivea, they have worked hard to create a more lightweight formula compared to eons ago. I love their sunscreen spray a lot because it's lightweight, but based from actual experience, it really does a good job in protecting my skin. I don't darken as much when I use Nivea. Currently, as I type this, I use Nivea's Kids lotion for my body everyday. I use Belo Sun for face, then Nivea for body. Nivea is a little bit on the emulsion side compared to the mousse type lotion that Belo seems to be going for. Each has its own strengths. I use Nivea for body because it doesn't get washed off as much. I use Belo for face because it's lightweight and you can still pile on a lot of makeup on top of it. Pond's also had a booth and showcased their newest items. 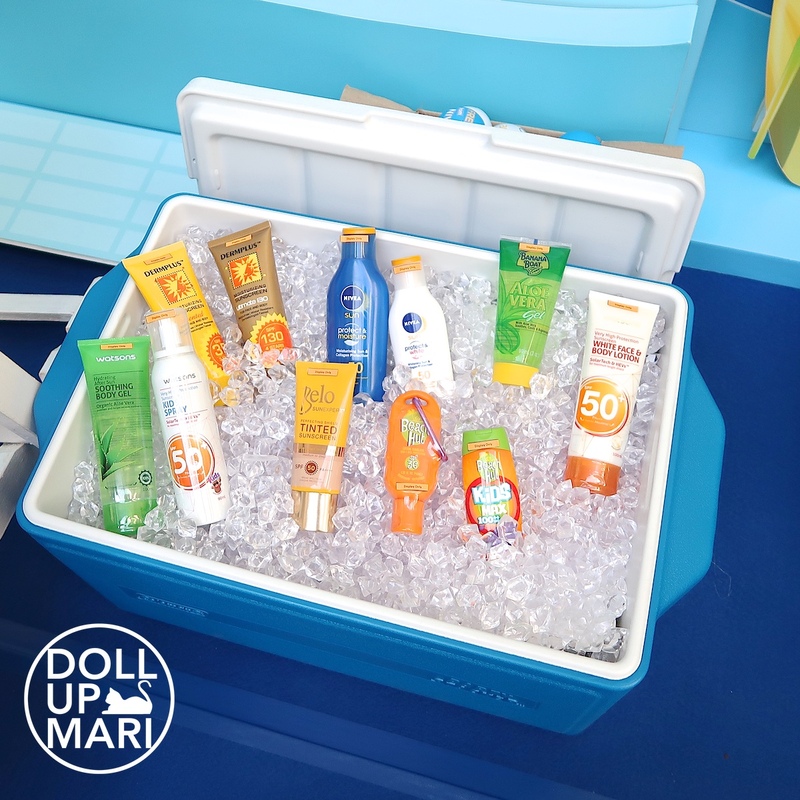 On the top of this shelf is Pond's newest White Beauty Daily Whitening Sun Protect SPF50 Sunscreen! This is promising for me because thus far, I've found Pond's mousse formula tricky at times. Even in my review of their day cream from waaaay back, I also noticed that the mousse formula sometimes gets blotchy on the crevices of the face, or if not blended properly. 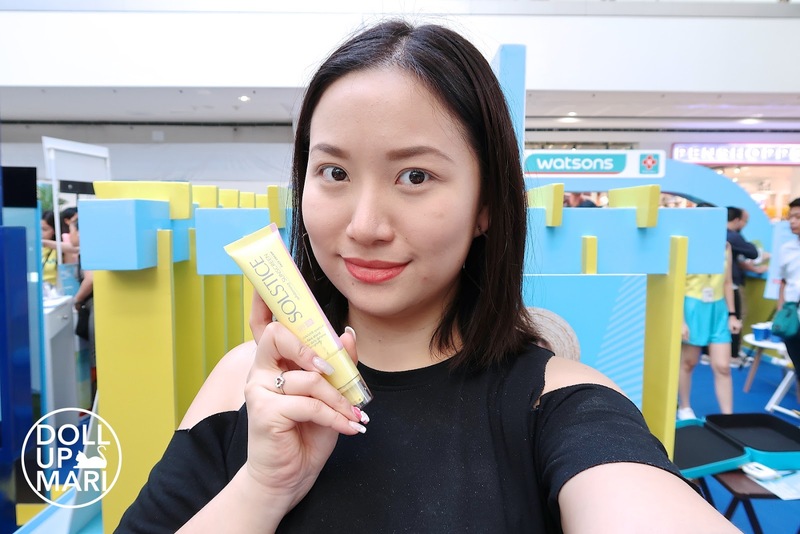 When I tried this sunscreen out in the event, despite having a mousse formula as well, at first impression, it was much more emollient and blendable than its mousse predecessors. Speaking of Unilever, may I also add that Block and White now has Sakura White! I was pleased because I think this is the first whitening brand to take on cherry blossom. To add, personally, I've felt that their papaya lines are great, but they also need new innovations like this one. Their take on cherry blossom is a very light and whimsical one. Gah, this brings back so much memories! When I was an intern at Unilever, my co-intern had to send a sample of the cherry blossom fragrance concentrate to an advertising firm so that the firm could spray all the furniture to be used for a Cherry Blossom themed product launch with cherry blossom fragrance. In the process of transferring the concentrated oil to a dispenser, some of it spilled onto the communal area couch! The end result was that our communal area smelled like a Japanese getaway for 2 weeks. Great times, great times! I look back at those days so fondly. Okay, going back, Dermplus also had a booth, but honestly, this is my first time encountering their brand. I'll be sure to report back if I find something interesting in their range! Elisse fans, rejoice! Repair your summer damaged hair without weighing it down with Cream Silk's Fresh Hydration conditioner! This limited edition conditioner features the very pretty Elisse Joson on the tubes, For me, the fragrance is a light and refined take on the usual Cream Silk fragrances, and though hard to describe, it smells like a summer getaway. For those who are looking for fragrance free sun care solutions, Solstice is here for you! The first thing I thought when I tried it at the event is that it'll be perfect for those who can't use products with fragrance. That quickly came up to mind because my mom has sensitive skin and needs to stick to brands like these. Upon checking the ingredients at home, there indeed is no fragrance. 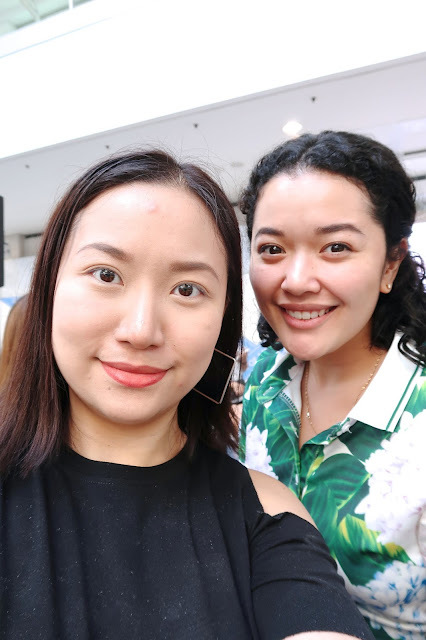 With Bo, who used to work on marketing for Simple Skincare, but is now working at the total beauty division of Unilever consumer development. And with Gloria!!! When I was an intern at Unilever, I had to get a lot of things photoshopped at the official in house graphic design firm in Unilever. Gloria was part of that team, so I spent many hours with their team during my internship. Whatever your summer dilemma may be, Watsons will surely have something for you! No, they didn't make me say that. I mean, have you actually ever seen someone walk in a Watsons store and not walk out with a whole throng of items?